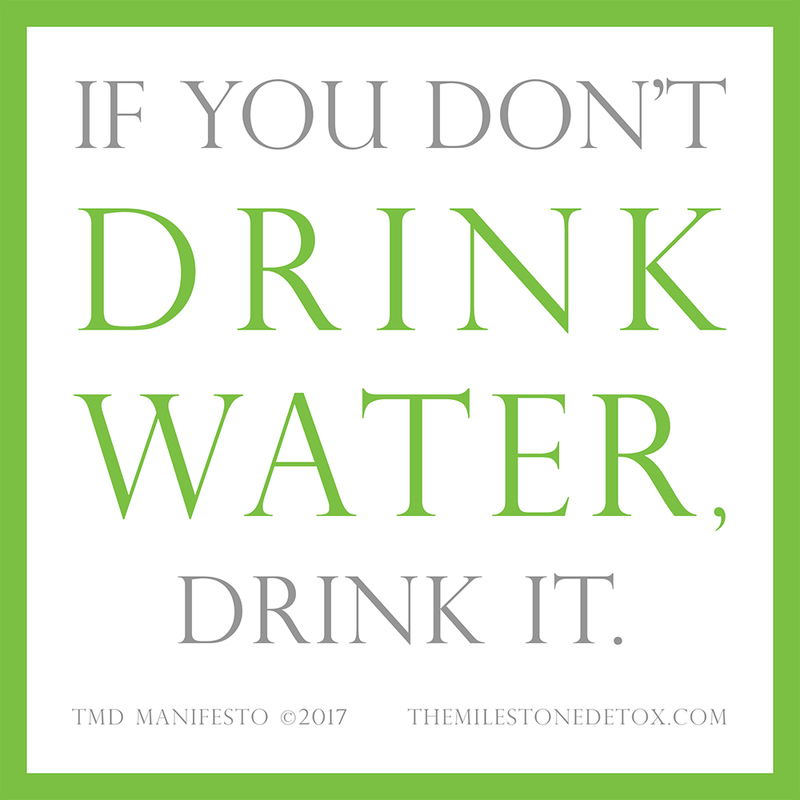 I’ve had people confess to me on a detox that they hate drinking water. Are you one of those? When you think about drinking water, what do you feel? Positive or negative? Do you have a habit of drinking water? I’m a habitual drink and travel-er. Whenever I set out on a journey, I always make sure there is water in the car. As soon as I pass through security in the airport, the first thing I do is buy water. When I wake up in the morning, I put the kettle on to boil, drink a tall glass of water and squeeze a lemon. By linking a circumstance to a behaviour, you can train your brain to do something automatically. (That’s a habit.) So as I write, there is a carafe of water on my desk and I drink as I pause to think. The ‘water in, water out’ flow doesn’t bother me. When I get up from my desk, my lymphatic system is activated and that movement keeps me trim and in shape. Water is easy to drink when it tastes good! Filtered, energised water tastes better than a straight glass of tap water. Glass bottled water seems to taste better than plastic bottled water. Spring or mineral waters taste better than plain bottled water and we can remember the disastrous story about Coca Cola’s 2004 launch of Dasani, which was revealed to be tap water. Water is essential. We get this. Without water, the planet dies. How much water is necessary and required? Surviving is not thriving so how much water do we need to drink in order to THRIVE? The European Food Safety Authority (EFSA) recommends an intake of 2.5 litres of water for men and 2.0 litres of water for women per day, via food and drink consumption (see reference). Dr. Batmangelidj recommends we drink half our body weight in ounces daily (see reference) so volume is determined by size. If you weigh 200lbs or 90kg, your body requires around 3 litres of water per day via high water content food and water. When you are hydrated, you think well, move well, feel well. It’s that simple. So if you aren’t in the habit of drinking water, drink it! We think of a juice as “produce water” because that is literally what it is. When you put a vegetable, a grass or a fruit through a juicer, you literally extract the coloured and flavoured water from that thing. The body was designed to be fuelled by this colour-rich, flavour-rich water and the cells in your body will thank you as they absorb it. Yes, it takes time to make a juice. May we encourage you to let us make them for you, book your detox today!